John Douglass and Sophia Neel Kountz, SOC/MA '85. A student dreams of becoming an astronaut. A man's quest to conserve land in the foothills of the Appalachians. Two sisters' dreams of baking and the last frontier. A glimpse into contemporary life in Chinatown, DC. A mother's struggle to bring attention to her daughter's disappearance. Three people's courage to do what is right in the most difficult times. Each of these stories was told thanks to the vision and support of an AU alumna who was grateful for her own experience in documentary filmmaking while at AU. She believes that the Film and Media Arts students have important stories to share with the world. With her help, these graduate students went on to screen their documentary films at festivals around the world, from Cannes to Santa Fe, and receive countless awards, including Student Academy Awards, one of the highest honors a student can achieve. Sophia Neel Kountz, SOC/MA '85, studied photography in high school, and had always enjoyed journalism more than fiction. Her interest in photography and journalism eventually led her to documentary filmmaking, and American University's Film and Media Arts program. As she embarked on her master's degree in the fall of 1983, Kountz met Professor John Douglass while taking a course on scriptwriting. When Douglass' TA unexpectedly quit, he turned to Kountz and asked if she would take the job. She accepted and worked with him until her graduation in 1985. Douglass had joined AU in 1978 and led the Film and Media Arts program from 1980 until this spring. He developed a program designed to balance the study of the media with production, and focused on storytelling and skill development. 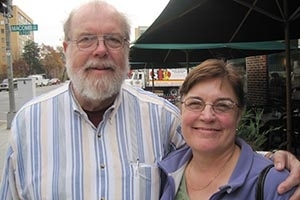 Over the years, Kountz and Douglass kept in contact, even as Kountz's career grew and she entered the education field, teaching English as a Second Language courses for over ten years. In 2004, grateful for the skills and education she received, Kountz met with Douglass and asked how she could help support graduate students in Film and Media Arts program. Douglass explained that students often had trouble covering the costs of the final post-production work on their thesis projects and needed funds for film festival and competition entry fees. Kountz was inspired by their conversation and the opportunity to help students in their final push towards graduation and completion of their films. Kountz thought, "it's about supporting the next generation of documentary filmmakers." She was eager to help them share their films with the public. Through the Neel Family Foundation, Kountz endowed the Neel Foundation Fund in Honor of John Douglass. She believes that anyone can start giving modestly and then consider what they want their legacy to be. The fund that now bears John Douglass' name recognizes the impact he has made on AU's film community over the past 30 years. Douglass said, "My career at AU has always been about enhancing the quality of student productions and helping students get into the industry. Our students tell meaningful stories that really do matter. The impact of this fund is not just on the students, it's on the audiences." If you would like to support emerging documentary filmmakers in AU's Film and Media Arts program in the School of Communication, you can make a gift to AU's Neel Foundation Fund in Honor of John Douglass by contacting Nada Maalouf at maalouf@american.edu or 202-885-2652.